Residency with Jonty Harrison at Atlantic Centre for the Arts, Florida. "I am interested in working with acousmatic composers and sound artists, particularly those who wish to explore the sounds of the real world (for example, sounds gathered in the geographical area around the ACA) and to develop them into new and striking works of sonic art (concert pieces or installations). The means of doing this will embrace studio recording and field recording (with contact microphones and hydrophones, as well as air mics) and software for sound transformation and mixing. Practical work will be informed by critical listening to, and discussion of, existing works that embody this approach. As well as time for individual work, there will be ample opportunity, in both one-to-one consultations and group sessions, to explore ways in which specific sound materials can be taken beyond straightforward documentation or collage, and be transformed and sculpted into coherent artistic statements. There will hopefully be an opportunity to present any developing or completed works by Associates at the end of the residency." This residency is for 3 weeks in October. Other Masters in Residence at the center will include Aram Bartholl (Visual Artist) and Josh Neufeld (Graphic Novelist). I am really looking forward to working with Jonty and all the other associate artists to share ideas, compose and collaborate. Also I have never been to FLORIDA!!! I arrived at ACA just in time for the welcome dinner where we were served wonderful food and wine. I met my group who are wonderful interesting composers, easy going with an eagerness to share ideas on recording and compositional techniques. We were given a tour of the campus. It is located in a wooded area, private and quiet with wonderful facilities that cater for composers, dances, visual artists and writers. After that we returned to the common area for some desert and wine. 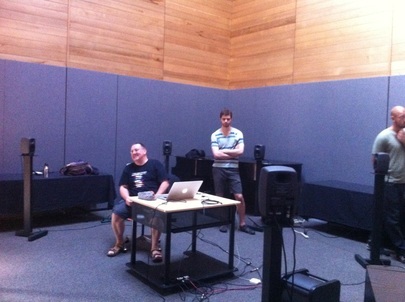 ​We set up an 8-channel studio in the music studios area and a stereo system in another room. Between all of us we had a lot of equipment, a wide range of microphones, recording devices and software. We discussed 8-channel composition and ambisonics and the different techniques and methods we use. We created a time-table so everyone had the opportunity to use the studio facilities, edit sound-files and compose. 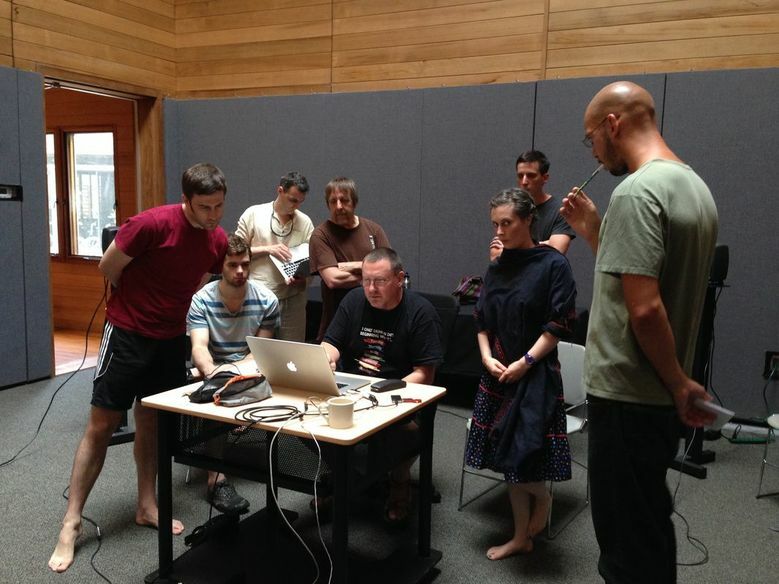 We also had group and 1:1 tutorials with Jonty where we had the opportunity to discuss works in progress, listening sessions, composing in Reaper and compositional techniques. As we finished up one of our group studio sessions, there was a massive thunder storm. There was a rush for recording equipment. I ran back to my room, grabbed my recording gear and went to run back to the studio to the others but it was too late. It was pouring. But luckily I could stand outside my room under a shelter and capture the thunder. I quickly set up my DPA's and H4n Zoom and began to record. The thunder ranged from muffled bangs to deafening claps. There was a a lot of peaking in the recording so I had to reduce the volume in order to capture the entire thunder clap peak free. After the thunder moved further away, the rain also eased off leaving behind the delicate sounds of water drops landing on the large palmetto leaves that populate this forested area. Once the rain eased off I ran back to the studio and borrowed Jonty's M&S rig which I have never used before. I found some sheltered areas and continued with my recording as the thunder returned without too much rainfall. On another outing our group went down to New Smyrna Beach to make some hydrophone recordings and I took along the M&S rig again. As we returned to the car we passed a garden centre with a wonderful sounding wind-chime which played a beautiful melody. 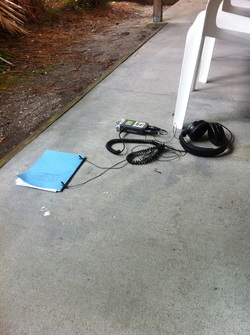 We recorded that and then moved on to the riverside where we made some more hydrophone recordings. I recorded a little bit but then grew tired of the incessant traffic noise. I decided to make some recordings in the children's playground where I recorded the sound of batteries and money being thrown down the slide. We also used contact mics on the metal frames. During this residency I made a lot of recordings using Jonty's M&S rig, experimenting with different recording techniques. I also composed using Reaper rather than Pro Tools which I have been meaning to learn for a while. I spent a lot of time just listening to the sounds around the grounds of ACA and enjoying the rhythmic patterns of cicadas, frogs and the rustling of lizards and small animals amongst the Saw Palmetto trees. The residency was a thoroughly enjoyable and inspirational three weeks where artists had the opportunity to share ideas, work on their own projects and enjoy the scenery and wildlife of New Smyrna Beach. I also learned a lot about the working progress of cartoonists, graphic novelist and visual artists. On the final evening we held an event, INsideOUT to showcase our work to the public. For this event I created a soundmap, documenting the areas around New Smyrna Beach where we had made our recordings. The cartoonists also contributed drawings of animals that we had recorded which were also placed on the the map. I am currently working on a piece using the recordings that I made and also those made by the other members of my group.